Practising Buddhist and master storyteller Dharmachari Nagaraja weaves a thrilling narrative spell while at the same time conveying basic life lessons that will help children to develop their personality, deal with their anxieties, and find peace and confidence as they grow up. The stories explore themes from the Eightfold Path, which is Buddhisms practical route to a happy life. Topics covered, with the lightest of touches, include speaking in a kind and truthful manner, behaving with compassion, thinking selflessly and avoiding the pitfalls of egotism. Although providing gentle guidance on the art of living well, which is the basis of true happiness, each story is also compelling in its own right, featuring characters, settings and events that every child will find absorbing. Each narrative concludes with an affirmation that helps to draw out its positive message, while the superb, specially commissioned illustrations will delight your child and provide a starting-point for discussion and further enjoyment. 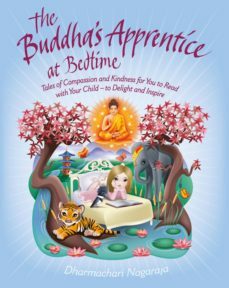 The helpful introduction provides insights into the value of Buddhist principles for children and shows how visualisation, imaginative thinking and even first steps in meditation can help to nurture young minds and hearts.